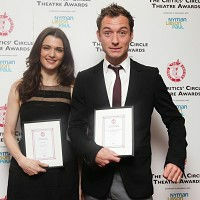 Well, the fire door had been carelessly left open so like model citizens we went in and pulled it firmly shut behind us and then it turned out we were in the Price of Wales Theatre and there was free drink and Rachel Weisz and Jude Law were and so we thought, what the hell, and stayed for The Critics’ Circle Theatre Awards 2009. The happiness of the Whingers depends on a lot of things when they visit a theatre: good sightlines, brevity, amusement and a competitively priced bar. But unlike Blanche Dubois they do not seek or expect kindness from strangers (or friends for that matter). Indeed, it is a word that rarely features in their limited vocabularies.